For many teens, braces are a rite of passage—a part of growing up and growing into the better versions of themselves they want to be. But aside from the correlation orthodontic treatment has with the adolescent experience, there are several reasons why the teen years are the optimal time to undergo braces or Invisalign at Mack Orthodontics. There’s no exact timetable for the development of every person’s teeth. But generally, most people lose their remaining baby teeth and develop the last of their permanent teeth between the ages of 11 – 13. As such, it is around this time that your orthodontist can work on correcting bad bites (malocclusions), improper tooth spacing, and poor tooth alignment. Orthodontic problems don't improve with age—they simply become harder to treat. It's easier to treat orthodontic issues during adolescence because the body is still growing rapidly and is therefore more receptive to change. In later years, when the bones of the face and jaw are fully developed, many conditions become more difficult and costly to treat. Whether through traditional braces, appliances like palatal expanders, or Invisalign, Dr. Mack can improve the appearance of your smile and enhance its function. Plus, since many adolescents undergo orthodontic treatment around the same time, patients feel more confident with their braces because classmates and friends have them too. They go through the process together, and when it’s done they share smiles they can be proud of and benefits that last a lifetime. need no introduction. But you might be surprised to learn they're smaller and lighter than ever before. Nowadays metal braces are more comfortable, and even offer some customizable options like colored elastic ties on the brackets. 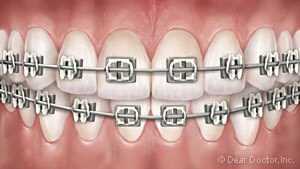 feature brackets made of ceramic or composite materials which blend in with your teeth, making them harder to notice. They're suitable in many situations, but they cost a little more. 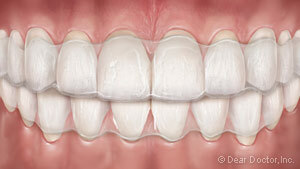 is a series of removable, clear plastic trays that gradually straightens teeth. Invisalign Teen comes with special features just for adolescents, like compliance indicators that tell your orthodontist how often you wear your aligners. Some advantages for Invisalign Teen include the aligners’ removability, comfort, and that they are practically invisible! offer the most unnoticeable form of orthodontic treatment because they are attached to the back (tongue side) of the teeth, where they cannot be seen at all. may be recommended when major tooth or jaw movement is needed. Such appliances can range from small devices that fit inside the mouth to external headgear. But don't worry, these types of treatments are temporary, and provide a long-term benefit in a short time of usage. Just as there is no treatment that is the same for everyone, orthodontic treatment timelines are different from person to person too. It all depends on what your orthodontist prescribes for your individual situation. 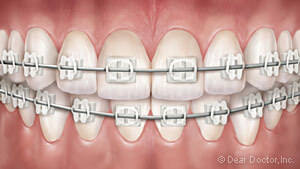 Generally though, the active stage of orthodontic treatment lasts between 6 - 30 months. 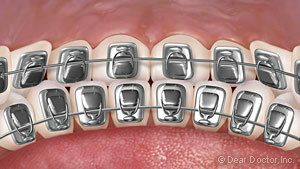 Afterwards, you will wear a retainer for a period known as the retention phase. The first time you come into our Bettendorf, Maquoketa, or Eldridge, IA office our team will take pictures and radiographic (X-ray) images of your mouth, and possibly make a model of your bite. Then your orthodontist will develop your treatment plan. To begin adolescent orthodontic treatment and start your journey toward a straighter, more confident smile, contact our Bettendorf, Maquoketa, or Eldridge, IA office today. Our orthodontist and skilled team of specialists look forward to helping you develop a beautiful smile!